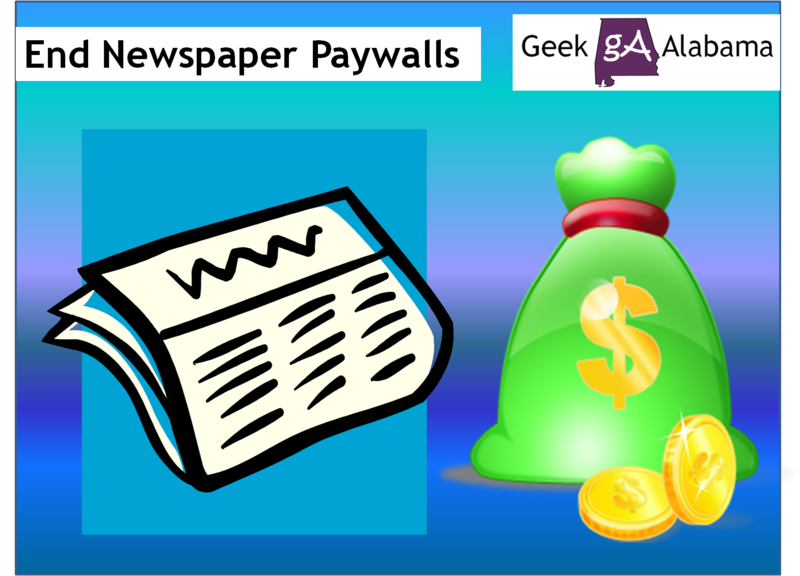 UPDATE: I did an presentation update to this original post called How To Get Around The Newspaper Paywalls. This presentation has several great ways to get around those paywalls, enjoy! Today, the Anniston Star joins a growing list of newspapers that are charging people to view content online. The Gadsden Times started doing this around a month ago and they charge you $9.95 a month for online content. The Anniston Star will charge people $13.00 dollars a month after the first month 99 cents promotional rate. This change has created a huge backlash online on social media sites. To me, I am not too surprised this is happening! Newspapers all across the country have lost subscribers since the internet was created. Many people have dropped their print subscriptions and have read the newspapers online. So newspapers are finding ways to recoup their revenue by charging people to read online. Some people have given up on newspapers all together because they lean-to the left as well. 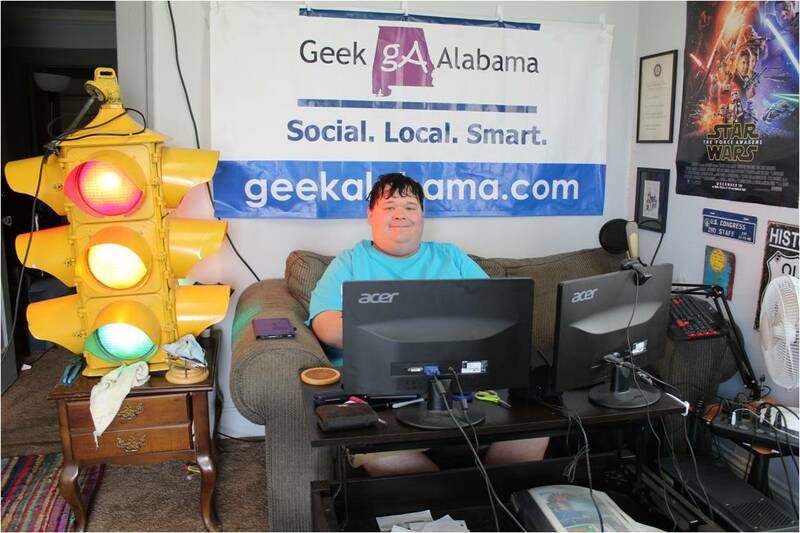 The newspapers around NE Alabama / NW Georgia also does not like me Nathan Young and the Geek Alabama blog because I am competition. Newspapers are dying, the website CareerCast named newspaper reporters as the worst job in America. Newspaper workers across the country have been laid off. And the workforce’s at many newspapers have shrunk through the years. At this rate, I don’t see a future for many smaller newspapers across the country. Sure, the big newspapers like the New York Times will always be around. And by the way, they have a much better paywall system than the other newspapers. Since this is Geek Alabama; I am here to show you, the average person, some ways to get around the newspaper paywalls. The first option is to go to websites like AL.com or the TV station websites whom often tells the same stories as the newspapers for free. Another simple way is to use a different internet browser when you reach the free article limit. I have Google Chrome and Internet Explorer installed on my computer. That means I can get double the free articles every month! Have you reached the free article limit and still don’t want to pay? I have found a very simple solution so you don’t have to pay. To do this trick, you need Internet Explorer installed on your computer. By the way, everyone should have two internet browser programs installed on your computer. I have Google Chrome and Internet Explorer installed on mine! Go to the control panel on your computer and click on Network and Internet. Then click on delete browsing history and cookies. You open up the internet properties folder. 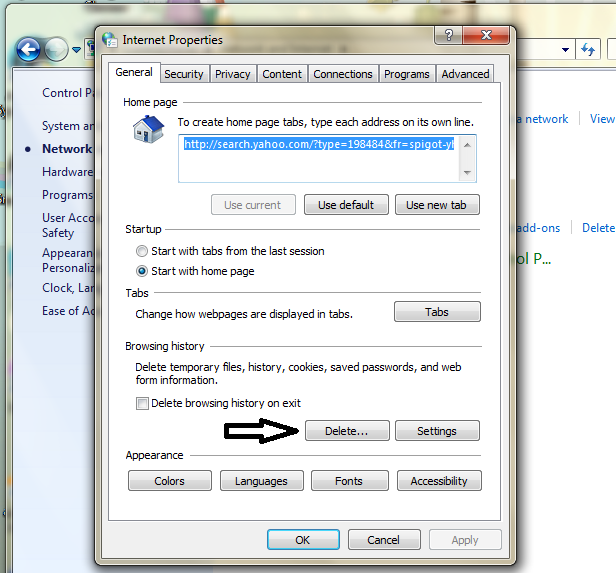 Make sure the tab is on “General”, then scroll down to Browsing History and click on delete. 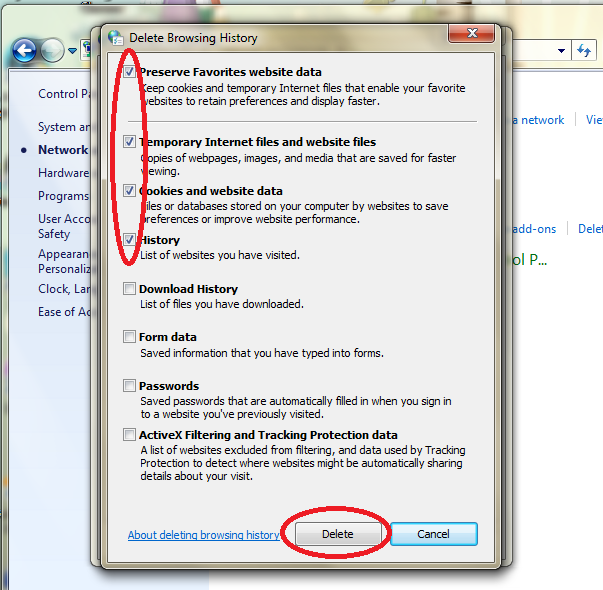 Make sure you have check-marked cookies and website data, history, and temporary internet files. Click on delete and there you go! 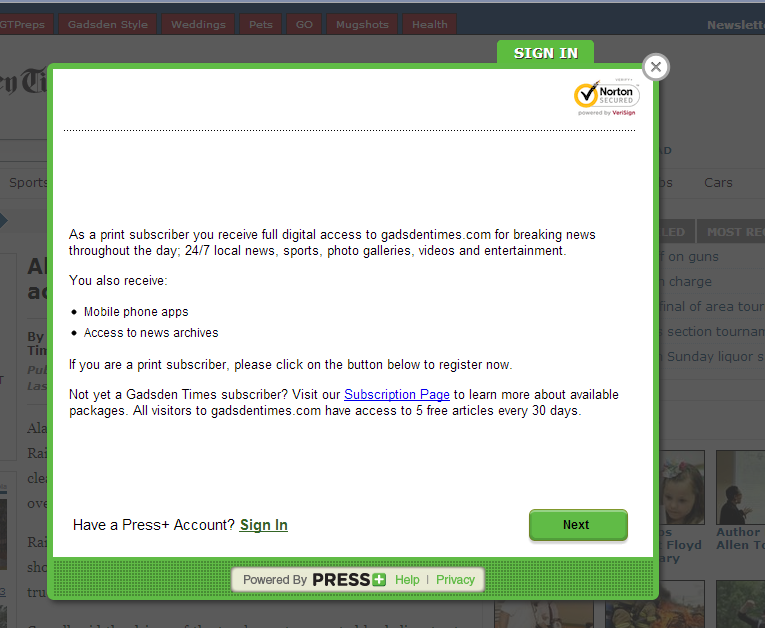 I tried this and that annoying pop-up you see on the Gadsden Times website is now gone. You have to do this every time after your free article limit is up. So for now, I will use Google Chrome for my average internet stuff and use Internet Explorer to access the newspapers! You have to be glad to not see a paywall pop-up! Before this post ends, the Anniston Star is putting a paywall on just about everything including videos and photos. That means this fall people are going to get angry when they can’t view their high school football photos. I have a great suggestion for TV 24! Why not hire me and two other people who would take photos at high school football games each week during the season. The photos would be put online for everyone to see for free! More people will come to you instead of going to the newspapers. It’s a win-win for everybody! FOR MANY OF THE LARGER, “NATIONAL” PAPERS YOU CAN ALSO FOLLOW THEM ON TWITTER. USUALLY ANY ARTICLE LINKS THEY TWEET ARE OUTSIDE THE PAYWALL. That works too for the big newspapers! Incognito mode 🙂 deletes cookies after you exit, leaving you with one browser and not deleting the ones you need. At least in chrome! Thanks for the tip and the comment! I would always have two browsers, just in case one goes down, it has happened before where Google has quit working. I have two as well 🙂 I just refuse to use IE haha. Chrome and firefox for me. Hey, Firefox is a good choice as well! I found your article interesting. However, I noticed that you made no mention to the fact that circulation of paid newspapers is regulated by the US Post Office. Until recently, online circulation could not be counted a part of a newspapers circulation. Now the Post Office allows the online readers to be counted, but only if they are paying at least 50% of the print newspapers price. My question to you is why you as an informed person have not discussed this fact. Can you please clarify this because I have found nothing online supporting your statement. Most newspapers are delivered by drivers and not the postal service. The postal service is only used to mail newspapers to people who live far away. I just do not see how the US Post Office can make money from newspapers that are not delivered by them.